For today’s post, Biblio Links welcomes author Cynthia Levinson! 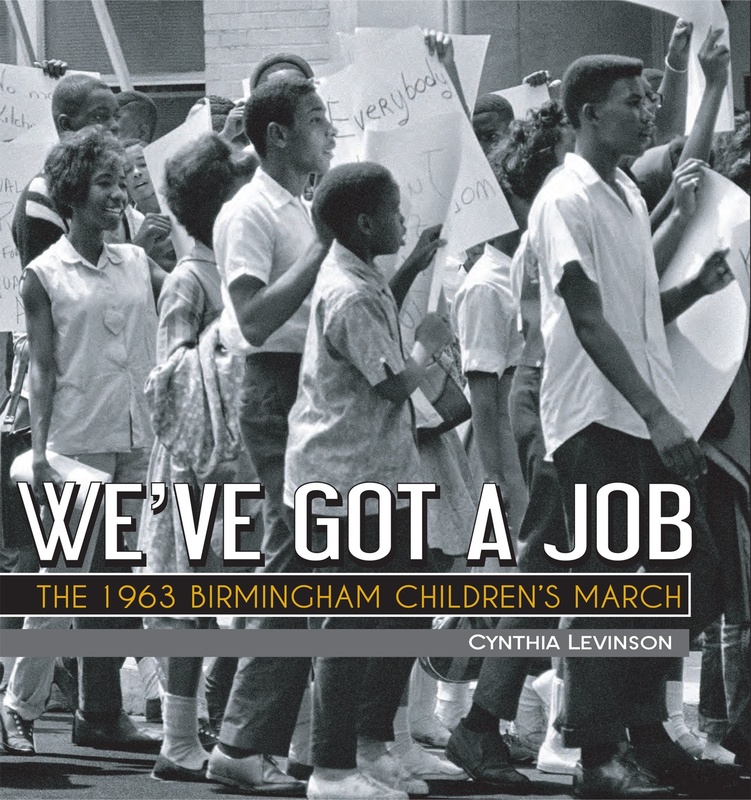 Cynthia’s debut book We’ve Got A Job: The 1963 Birmingham Children’s March has garnered three stars (from Kirkus, Publishers Weekly, and Booklist (that’s all before the book’s release date! ), and has already been dubbed one of the “promising candidates for the 2013 Newbery Medal” by School Library Journal’s blog Heavy Medal: A Mock Newbery Blog. Between May 2 and May 7, 1963, 3,000-4,000 children–yes, children–marched to protest segregation and to get arrested and jailed in Birmingham, Alabama. Many of them were charged by snarling police dogs and washed down the street by powerful fire hoses. Nevertheless, day after day, more of them marched and went to jail. Why? To find the answer to that question (and more), I decided to sit down and ask Cynthia more about her book. Cynthia Levinson: You’d probably see a mixture of concentration and hubbub! Kids listening to civil rights songs, poring over photos, role-playing protesters and segregationists, quietly discussing strategies to change society, shouting about whether or not children should be placed in danger for a cause. One of the valuable aspects of We’ve Got a Job is that students from fourth grade through twelfth grade have read it, learned from it, and enjoyed it. So, what you would see depends on whether you’re peeking into an elementary, middle, or high school classroom and whether you’re in an English Language Arts or a Social Studies class; it works equally well with both subjects. One fourth-grade ELA teacher in Round Rock, Texas asked students to take turns reading the section headings aloud to get an overview of the story. Then, the class wrote quotations of Dr. King’s on chart paper and explained what the statements meant to them. Another fourth-grade class in Round Rock, which is making a video trailer for the book, wrote a script, using quotations from the people I interviewed for the book. A couple of these teachers and I gave presentations on how they taught the book at the annual conventions of both the National Council of Teachers of English (NCTE) and the National Council for the Social Studies (NCSS). Their Lesson Plans and Discussion Questions for various grade levels and subject areas are available on my website, www.cynthialevinson.com. And, you are developing the world’s best Curriculum Guide! So, teachers can use the book in LOTS of ways. Biblio Links: A student walks into my library and I think, “That kid needs a copy of WE’VE GOT A JOB: THE 1963 CHILDREN’S BIRMINGHAM MARCH.” Who is this kid? Cynthia Levinson: Well, of course, I think Every Kid! Any child who feels bullied or sidelined. Any child who feels discouraged and powerless. Any child who needs to see how much young people can accomplish will get a boost from this book. Cynthia Levinson:My website offers lots of information, with pages on the marchers, contemporary newspaper headlines, and interviews with me about writing the book, as well as suggestions for teaching techniques. More of all of these will be added over the coming weeks. In addition, I recommend that teachers, librarians, and students go to some of the same sources I used, including the website of the Birmingham Civil Rights Institute and books for young readers listed in my bibliography. This entry was posted in Birmingham, Civil Rights, hope, middle grade, non-fiction, protests, young adult and tagged Civil Rights, Cynthia Levinson, WE'VE GOT A JOB. Bookmark the permalink. I enjoyed this one and learned so much! My high school history classes seemed to have stopped covering history after 1950, so there are a lot of facets that I’ve not learned about. This was great. I’m so glad you enjoyed it, Ms. Yingling! It really is a riveting, little-known chapter in history, isn’t it?